What this information does say is that claims of increases of violent crime over time are inherently false, regardless of what is being pointed to. 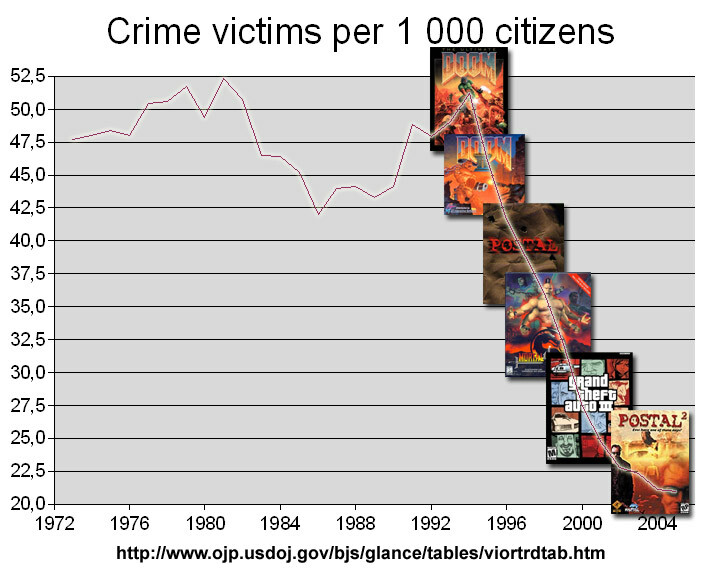 We can safely state that violent video games have not increased violent crime at a national level for the reason that there isn’t an increase of violent crime to begin with. Obviously there are more complexities in the situation to say that any one factor is the deciding factor. But isn’t that the problem? There are certain lawmakers point to violent video games as a reason seem to be interested in investing time and money on appearances that they are solving existing social problems. Obviously these resources would be better spent investing in long-term solutions, but these solutions are not easily communicated to a voter. Here’s a title idea for anyone to take on. Interactive entertainment is a very strong and powerful media that can make the depth of a subject matter more accessible to an audience. As SimCity provides accessible depth of urban planning and zoning, perhaps a title exploring social and economics to better illustrate the complexities of violent crime and related social woes would help create a better informed society. If you do this, or even address a microcosm of this situation, people will want you to work for them and you can pretty much ask for any grants to do similar work. No need to wait for me to approve the idea, just go out, do it, and do it well! Editor’s Note: Hosting the image locally as to not leach bandwidth.